What is the latest report out of Camp X? 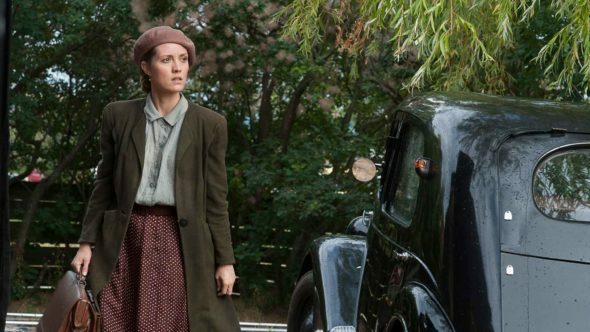 Is the X Company TV show cancelled or renewed for a third season on Ovation? The television vulture is watching all the latest cancellation and renewal news, so this page is the place to track the status of X Company, season three. Bookmark it, or subscribe for the latest updates. Remember, the television vulture is watching your shows. Are you? An Ovation spy thriller, X Company stars Évelyne Brochu, Jack Laskey, Hugh Dillon, Warren Brown, Dustin Milligan, Connor Price, and Lara Jean Chorostecki. A Canadian/Hungarian spy thriller from creators Mark Ellis and Stephanie Morgenstern, this World War II drama is inspired by the true story of a Lake Ontario espionage training compound. The action centers on five gifted recruits who leave behind their lives and go to Camp X, to train as spies for the Allies. Season two finds the team on the ground in German-occupied France, two men down, compromised, and cut off from communications with Camp X. In 2017, Ovation ordered all three seasons of X Company. Season three debuts August 20, 2018. Stay tuned for further updates. X Company originally ran for three seasons on CBC, before ending. When Ovation ordered it in 2017, they picked up all three cycles. The cable network is unlikely to cancel it, because they knew what they were getting when they bought it. Still, sometimes outside factors, like new management and/or a change in focus, can affect the life of TV shows which had previously been considered safe. Expect it to come back, for season three, but I’ll keep an eye on the trades and update this page with breaking developments. Subscribe for free X Company cancellation and renewal alerts. Check the ratings for network TV shows. Find more X Company TV series news or other Ovation TV show news. What do you think? If it were up to you, would Ovation cancel or renew the X Company TV show beyond the third season? X Company has been the show to watch on Mondays. We can hardly wait for the third season to be shown. Looking forward to Season 3. Acting is great & seems very realistic with the scenes & locations. OMG! This is by far the best show on television. I am very picky when it comes to what I watch and this blows everything else away. The acting is superb. The locations are beautiful and the props are amazing. Very, very well written. Season 3 better be shown and then some. Please air the third season soon! I’m so looking forward to seeing it! Love X Company! EST show on tv! I’m thoroughly enjoying this miniseries! Sad to learn only 3 seasons in total. Ovation, please air Season3. It’s well written, produced, edited, acted; every episode keeps me and holds me wanting more. Not only entertainment, it’s educational to see how espionage played out in that period. I sympathize with the characters and relish the lengths the show went on props, locations, costumes, pyrotechnics to create such realism. I hope they renew it, the acting is great, story line is very good. Vert entertaining. The show makes you feel some of the fear these people lived with knowing the Germans were out to get them.